Steel tycoon Lakshmi Niwas Mittal is the richest Indian in the world, with an estimated wealth of $25 billion. He resides in London, has his company registered in the Netherlands, but still holds an Indian passport. Although Mittal Steel was already the world's biggest steel company, his king-sized ambitions were evident when he took over steel giant Arcelor to create a new steel behemoth -- Arcelor-Mittal. Ratan Naval Tata, a bachelor, is the chairman of the Tata Group, India's most respected conglomerate. He was born into a Parsi family in Mumbai (then called Bombay) to Soonoo and Naval Hormusji Tata on December 28, 1937. He did a short stint with Jones and Emmons in Los Angeles, California, before returning to India in 1962. He had earlier turned down an IBM job offer. He joined the family business in 1962 and worked with many of his group's companies. He took over as group chairman from the legendary J R D Tata in 1991. Since then, he has been instrumental in boosting the fortunes of the Tata Group, which has amongst the largest market capitalisations in the Indian stock markets. Tata Motors developed the Tata Indica in 1998. This was the first 'entirely Indian' passenger car. 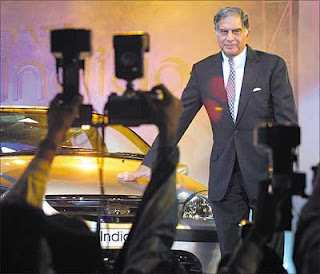 Ratan Tata's dream now is to manufacture a car costing just Rs 100,000. Ratan Tata holds a degree in Architecture and Structural Engineering from Cornell University. He has also done the Advanced Management Program from Harvard Business School in 1974-1975. Ratan Tata was honoured with one of India's highest civilian awards, the Padma Bhushan, on January 26, 2000. Mukesh Ambani, the chairman and managing director of India's largest private sector enterprise -- Reliance Industries Limited -- was born on April 19, 1957. His father, the legendary Dhirubhai Ambani, was then a small businessman who later on rose to become one of the legends of Indian industry. Nandan Nilekani is the CEO and managing director of Infosys Technologies. He, along with N R Narayana Murthy and five others, co-founded India's IT jewel, Infosys. Born in Bangalore to Durga and Mohan Rao Nilekani, he graduated from the Indian Institute of Technology, Bombay. Azim Hashim Premji, the chairman of Wipro Technologies, is one of the richest Indians. He is an icon among Indian businessmen, especially in the software industry. Born on July 24, 1945, Premji was studying Electrical Engineering at Stanford University, USA when due to the sudden demise of his father, he was called upon to handle the family business at the age of 21. The fourth richest Indian today, with a net worth of about $13.5 billion, Anil Ambani is chairman of Reliance Communications, Reliance Capital, Reliance Energy and Reliance Natural Resources Limited. Sunil B Mittal is chairman and managing director of Bharti group. Bharti is India's largest GSM-based mobile phone service. Son of a politician, he built his Bharti group, along with two siblings, into India's largest mobile phone operator in just ten years. Vodafone and SingTel both own stakes in recently renamed flagship Bharti Airtel. The group also has partnerships with Axa for insurance and with the Rothschild family for exporting fruits and vegetables. He plans to go into retailing along with the world's largest retailer Wal-Mart. Kundapur Vaman Kamath is the managing director and CEO of ICICI Bank, the largest private bank in India. Kamath, born on December 2, 1947, began his career with ICICI -- the parent body of ICICI Bank -- in 1971 and has since then worked to take ICICI places. He has helped the financial institution evolve into a modern, tech-savvy organisation. Kumar Mangalam Birla, born on June 14, 1967, is among the richest persons in India and the eighth youngest billionaire outside India. He is chairman of the Aditya Birla Group, one of India's largest business groups. Some of the AV Birla group's companies are: Grasim, Hindalco, UltraTech Cement, Aditya Birla Nuvo and Idea Cellular. Rahul Bajaj is the chairman of the Bajaj Group, which ranks among the top 10 business houses in India. He is one of India's most distinguished business leaders and internationally respected for his business acumen and entrepreneurial spirit.